The first documented bicycle club in the Gt. Yarmouth area, held its first race in September 1879. The winner of the event E.H. Morgan won a trophy which was donated by the Mayor of the time E.H.H. Combe, Esq. A year after this inaugural race in the town, the Comet Bicycle was established and held a “Club Run” from Britannia Pier over to Norwich taking place on 26th March and in June of the same year, a Handicap race for club members was held along South Denes road. In September the club held a 10-mile race between Acle and Gt. Yarmouth, the prize for the event was a Silver medal to be presented by Mr. J.F. Derry, only two members decided to take part, the winner being the Club’s Vice-Captain Mr. R Thompson. In 1891 the Club held its second annual race meeting where a few more members were riding, the one-mile championship was won by W.E. Sacret, starting last; being the scratch rider, he not only won the handicap award but also the scratch event. The “Yarmouth Independent” of 7th February 1891 reported that the “re-organised” Gorleston Bicycle Club would meet at the Crown & Anchor Inn on Baker Street in Gorleston. The 28th February issue noted that the subscription was 2/- annually, & in the 21st March issue, it was reported that the first ride would start at the Recreation Ground. Meanwhile, the 28th March 1891 issue reported the second Annual General Meeting of the East Norfolk Cycling Club, whose headquarters were at Jubilee Works, Lancaster Road, & whose badge was a wheel & flying fish. The Great Yarmouth Cycling Club held an 18-mile handicap event through the villages south of Gorleston in September 1897. The event was won by a D.A. Lockhart in a very respectable, considering the machines of the time, in 1 hour 24 minutes. It is also known that the Great Yarmouth Wheelers were formed in 1891 and by 1889 another club was formed this being East Norfolk Cycling Club. When the Wellesley Road recreation ground opened, a cinder cycling track was added to deal with the great interest in cycling that had built up in previous years. The grounds opening athletic and cycling meeting included events for both bicycles and tricycles, these meeting continued for a number of years and attracted many stars, in 1893 A.J. Watson (National 5 mile Champion) won both the scratch cycling events. There was also an Athletic and Cycling track in nearby Gorleston, at the Recreation ground near to St. Andrews Church, though there appear to be no records available as to any events held there. From 1894 cycling events were held for several years, at the recreation ground, in conjunction with Essex Cycling Union Limited. These meetings were advertised as the greatest gathering of London and Norfolk crack riders and runners ever seen. The Great Yarmouth Wheelers were formed in 1891 and organised their annual sports on the Wellesley recreation ground and in 1895 organised a 130-mile circuit of Norfolk, the course for this event went to Kings Lynn and back via Dereham and Thetford. In 1898 the 50 mile National Cycling Union Championship for the Eastern Counties was run off on the Track at Wellesley road (Lap distance for the track was approx 580yards), the race was won by the holder, C.F. Morley of Cambridge in a time of 2 hours 33 minutes and 48 seconds, again a very creditable time considering the machines of the day. Run in conjunction with this race was an event closed to members of Gt. Yarmouth Wheelers, this was the race for the Buxton Challenge cup won by Thomas S. Fitch, who was also the previous year’s winner. By 1903, after a couple of lean years, the Wheelers decided to revive the club’s activities by holding a regular Tuesday ride and also a 7 event sports meeting at the old recreation ground. The club’s championship was to be a 2-mile scratch event; the previous winner Hugh Trett decided not to defend his title, the new winner being John Gosling, with Thomas S. Fitch in second place. Track cycling was held regularly at the Wellesley ground, normally in combination with the annual Athletics sports events. In 1905 at one of these meets the Eastern Counties 1 mile championship was held and won by W. Elden of Norwich. Sadly very little else is known about these Clubs, but presumably, they had all ceased by the First World War. Yarmouth & Gorleston Wheelers – This cycling club was formed on Friday at a meeting well supported by cycling enthusiasts. Mr. G.H.L. Blake, who presided, referred to the old Yarmouth Wheelers, dating back to 1879, & promised to give the club his best support. It was moved & carried that ladies be admitted. A committee was appointed to draw up rules which are to be submitted to a meeting in the near future. The club is open to all amateur cyclists. A general meeting will be held at the Alpha House, Northgate Street, next Wednesday, at 8 o’clock, for the election of officers etc. Mr. G.H.L. Blake will preside. All cyclists, ladies & gentleman, are invited to attend & join. The committee have drawn up some rules, which will be submitted to the meeting. Some club letterheads etc. produced in the 1930’s suggest the club was founded in 1923, but this was later corrected. The first race the wheelers promoted was over 20 miles, the event held in June of that year but due to strong winds on the day, the event only attracted 9 riders, the winner being D. Nichols in a time of 1 hour 11 minutes and 26 seconds. Subsequent events were arranged for most Thursday, Saturdays and Sundays throughout the summer. Not all of the events were of a competitive nature though, some just riders in and around the area. One such ride, a 100-mile ride down to Woodbridge was undertaken in the first month of the club’s formation. In June 1925 a 25 mile Time Trial was held, the event was won by E.V. Jary (whose day job was the local Butcher) in a time of 1 hour 15 minutes and 21 seconds, the 50 mile held in July was also won by Jary in a time of 2 hours 45 minutes and 9 seconds. 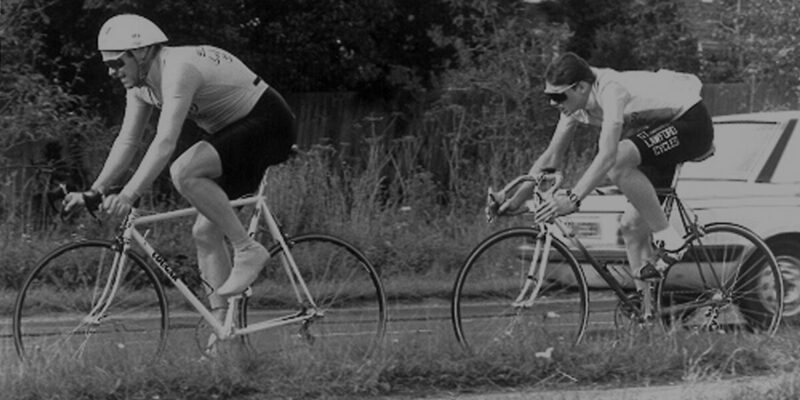 Later on in the season, an “Open” 50 mile Time Trial was held in the district which attracted some of the fastest riders in East Anglia, the event won by W.J. Frost (East Anglian C.C.) in a time of 2 hours 27 minutes and 30 seconds, the first Y. & G. W. rider being H. Downes in a time of 2 hours 42 minutes and 30 seconds. In the 1926 season Jary repeated his successes of the previous year in both the 25-mile and Haddon 50-mile events. To add to these victories, he also won two track events held on the Wellesley Recreation, namely the 2 lap handicap and the 1-mile club championship. In 1927 Jary returned to defend the Haddon 50-mile event but that was the last year he was to win this event as in 1928 H. Downes won the Haddon event in a time of 2 hours 32 minutes and 10 seconds in a very close finish with J.H. Thurston only a scant 2 seconds behind in second place. There seems to be some confusion regarding times for the30-mile time trial, as the times quoted would have been national completion records of the time, so I’m assuming that these times relate to 25-mile time trial records. Vernon Arthur Williams (the club’s Hon. Sec.) dropped the 25 mile record down to 1 hour 10 minutes and 19 seconds in 1928 which he further reduced the following year down to 1 hour 9 minutes and 7 seconds. In the same year he also set the club’s 50 mile record of 2 hours 26 minutes and 30 seconds. The “25” mile record was further reduced in 1930 when J. Hathaway recorded 1 hour 8 minutes and 3 seconds. Ladies were not to be outdone as in 1934, the Club proposed two special ladies only events, a 10 and 20 mile scratch race, were to be included into the summer programme. The first competitive event was a 25 mile Time Trial won by W.D.G. Dulieu with a time of 1 hour 14 minutes and 11 seconds. The first of the ladies 20 mile event attracted 3 entrants, the winner being a Miss M. Sudden in a time of 1 hour 4 minutes and 22 seconds, with a Miss A.E. Fuller in second place. Miss Sudden also won the 10 mile unfortunately no details of this event being recorded. Later on in the year, the club first held its 30 mile championship event, thirteen entrants, the winner was J.A. Hathaway, with Dulieu second and Williams third (again unfortunately no other details are available), and then the 50 championship (Haddon Trophy on handicap) this being won by H.E. Robinson. The fastest rider on the day was W.D.G. Dulieu in a club record time of 2 hours 22 minutes and 4 seconds. It was noted, in the minutes of the 1935 A.G.M. that the current membership stood at a very respectable 75; almost double that of the previous year, the club continuing to promote a very busy and mixed schedule of events throughout the year. In the 1937 A.G.M. minutes W.D.G. Dulieu made a plea for the cycling track at the Wellesley ground to be made usable again, as it was felt there was a need for this facility. The pre-war membership reached over 100, a figure virtually unimaginable today. During this time members took part in various activities, one of the more interesting of which was a week-long roller racing completion organised by the “Hercules Cycle Company” & held in the Regal Cinema. As a result of this, the club received the oldest (& the largest & much coveted!) trophy awarded continually until the present day, the Hercules 25 mile Trophy. The club disbanded in 1940 as members became involved in the war effort, & the officials at the time signed a document by which they asked the Norfolk & Norwich Savings Bank to hold the funds of the club for the duration or the war. Under the terms of this document, if one or more former members of the club had not re-formed the club within two years of the cessation of hostilities, the funds were to be donated to the Great Yarmouth General Hospital. …..Shortly before Easter 19465 about 10 of us pre-war members met at Harold’s House & decided if there was sufficient interest amongst us to re-form the club – the feeling of the meeting left us in doubt…. & so at a General Meeting later we elected our Officers & off we went. Yarmouth & Gorleston Wheelers, whose pre-war membership was over 100, decided to recommence activities when a revival meeting was held at the Star & Garter, Hall Quay, on Thursday evening of last week. Mr. C.F. Boulton, the club’s pre-war chairman presided. The secretary, Mr. H.G. Clarke, in his report, said the club disbanded in 1940, & during the war the majority of members travelled to all parts of the globe. “They probably will again” said Mr. Clarke, “though next time it will be on a good old so-called push-bike”. Urging that new & young members should join the club, Mr. Clarke asked present members to “get into the sadlle” & show by their enthusiasm the spirit of the club. The club during the war lost three members…..
……it appears to have made little difference to our new member intake, in fact they [Yarmouth Road Club] seem to cater for the purely racing man as against our tradition of the all-round type of person. There is a keen rivalry springing up between the two clubs which should be all to the good for the cycling game in the district. Despite this, the Wheelers did gain a few members during 1950 & had 70 members (an increase of 7 on the year) by January 1951. The gains were to be short-lived though, with a decrease to 50 by January 1952 & a further drop to 26 a year later. This meeting agrees to the amalgamation of the Yarmouth Road Club & the Yarmouth & Gorleston Wheelers under the name of the Yarmouth & Gorleston Wheelers C.C. [Y&GWCC] as from 23rd January 1955, that before this date the Yarmouth Road Club shall after payment of all liabilities dispose of any remaining assets as they so wish, & the Yarmouth & Gorleston Wheelers guarantee one year’s membership to all members of the Yarmouth Road Club on payment of the usual Yarmouth & Gorleston Wheelers subscription, & that the Rules & Standing Orders of the amalgamated clubs shall be those as used at present by the Yarmouth & Gorleston Wheelers with the exception of any amendments. 22 members attended the first AGM of the combined clubs on 24th January 1955. The club continued reasonably successfully through the following years but membership began to decline in the early 1960’s until by 1965 there were just 7 full members, though boosted by the resident, Vice President & second claim members. Yet 60 attended the annual dinner that year. A year later there were just 2 full members & the dinner was held jointly with Lowestoft Wheelers. For the next 6 years the club was kept existence by its 2 remaining members, John Parker & Jack Lingwood. They continued to pay their subscriptions of 7/6 per annum, with John even making a loan to the club to ensure it had sufficient funds to continue to insure the trophies. In 1973, a number of visitors to Lawford Cycles expressed an interest in forming a cycling club & Bill Ford approached Jack & John, who suggested reviving the Y&GWCC. Eight people attended a meeting on 20th June 1973 to establish the proposed rules & an inaugural meeting was arranged for the 5th July, to which all life members of the Y&GWCC were invited. At this meeting Jack Lingwood was elected Chairman, Bill Ford the secretary & John Parker the Treasurer. The annual subscription was set at £1.00 & the membership quickly reached 24. The first club 10 mile time trial was held on 2nd September of that year & the first open events the following year. In late 1979, Ray Lawler offered to sponsor the club & a Special General Meeting was held on 16th November of that year at which the membership voted to accept the offer. It was also agreed to change the name of the club to Great Yarmouth Cycling Club Lawford Cycles, which is how it remained for the next 18 years. The club is now co-sponsored by Pedal Revolution and 1st Call Car Parts, which has helped the club to maintain its help to junior riders in the club. The 100 mile record has decreased from 5 hours 18 mins. 57 sec’s. In 1935 to 4 hours 19 mins. 48 sec’s set on the 14th July 1991. From 1991 to 1995, Norman Harlow held the club records at 10, 25, 30, 50 & 100 miles, & still holds the latter three today. The club held its first ever circuit race, the East Coast “Kermesse” at the Seashore Holiday Camp on the 18th March 1962. The club staged Cyclo-cross events for several years from 1977, initially at Bure Park & later at Seashore Holiday Camp. In 1981 the club commenced holding road races over a circuit based on Martham & from 1984 – 87, held criterium races in Great Yarmouth town centre. This year (2016) the club has re-introduced a road race held over a circuit in and around the Lound/Somerleyton area.